What does the future hold for public broadcasting in Europe? In its report “Public broadcasting in the digital age: how will globalised consumption shape the future?” IDATE DigiWorld analyses four main strategic paths being taken by public broadcasters in Europe. All of Europe’s public broadcasting services are facing the same challenges, namely: budget cuts due to weakened economies, and their purpose being called into question, the need to attract a younger audience with content that appeals and fierce competition from international rivals. In other words, no shortage of challenges for these veteran broadcasters. Public service channels are having to compete with internet-based services offering a massive selection of content. Within this glut of available programming, viewers can easily find both mainstream content with broad appeal and very niche content. As a result, the value and legitimacy of the content being delivered by public broadcasters are being challenged in a growing number of countries. The revenue generated by the main public broadcasting services in Europe has stagnated since 2012 (-0.2% a year on average), whereas revenue generated by their private sector counterparts has increased by an average 7.8% a year. The percentage of media revenue earned by the top 24 of Europe’s 50 biggest public broadcasters dropped from 45% in 2012 to 36% in 2017. Over time, public broadcasters have seen thematic channels appear and disappear, or shift their tack. This trend is now rippling out as traditional TV networks are being shut down and OTT services being created in their stead. British channel BBC Three, which was rolled out as a DTT channel in 2003, had to deal with massive budget cuts. As a way to maintain the quality of its content, the channel elected to switch over to delivering its content online. The BBC example is a not uncommon choice for many of Europe’s public broadcasting corporations, and serves as a textbook case of the possible shape of things to come. Public broadcasters in Europe are also exploring other strategic options, either as alternatives or as complements to traditional models, seeking to generate internal synergies between their TV, radio and internet operations, developing OTT-centric cooperation with private media companies, or broader partnerships with their public service counterparts across Europe. 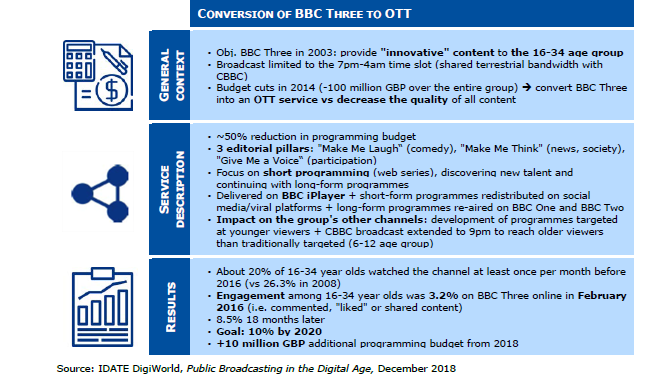 What is the outlook for public broadcasting in Europe ? Based on an analysis of the different strategies being adopted by public broadcasters, IDATE DigiWorld has established four possible development scenarios for the broadcasting industry up to 2025, Ranging from the most cautious (low-cost scenario) to the riskiest (disruption scenario), by way of a lucrative scenario (syndication) and an alternative solution (convergence scenario). Buy our last report: "Public Broadcasting in the Digital Age"